You are a 16 year-old high school student. It’s Friday morning, second period… Algebra. The teacher walks in and gives that pop quiz he’s been promising all week: a sheet of paper with a one-line question on it. You take one look at it and realize that you will solve this in 10 minutes tops. You know this. You’ve got it. You WILL ace this quiz! Monday morning. You get the quiz back and to your horror, you got a failing grade! You cannot believe it. What went wrong? You were absolutely convinced that you did it correctly. You followed the tried and true method. Step by step, one equation after the other. There is NOTHING wrong here. You go to the teacher and you ask what you did wrong and he points you to the second line where you made this small, but significant, calculation mistake which rendered everything that came after it a series of errors, culminating in the wrong answer. That is exactly what the Syrian president Bashar Al-Assad has done with his decision to violently repress the pro-democracy protests in his country. He has made a small, but significant, calculation mistake and all what will follow from it will yield all the wrong answers. The Syrian regime was in an enviable position relative to its counterparts in other Arab countries. The vast majority of the protesters on the streets of Syrian cities were not calling for the president to step down, nor even for the regime to change. Even some of the major opposition intellectuals in Syria and abroad clearly stated they were willing to work with the young president to institute much needed reforms, as long as he was willing to engage in genuine and deep reforms, and initiate the process quickly. Syrians were asking to live in a more free, transparent and responsive political system. They were asking for a clamp down on corruption and for their basic economic needs to be met. They just wanted to live in dignity and some measure of political freedom. When seen from this perspective the response of the regime is grossly exaggerated and unnecessarily violent. Such a bloody, brutal, response to such relatively modest demands - by comparison to Egypt for instance - can only mean that the regime is excessively paranoid. It also might suggest that major elements within the regime feel directly threatened by any demand for greater freedom, or perhaps more importantly, clamp down on corruption. Thus, Bashar Al-Assad chose oppression over dialogue and in that he has made his calculation mistake. He used all the right equations from the dictatorship handbook. He is applying them with all the tried and true methods. Yet, once your initial calculation is in error, the answer will be wrong. The calculation error lies in the fact that the Syrian president is neglecting two major issues. First, this is a genuine popular revolt, not an insurrection by militants. Had he responded positively and openly, he would have won the support of his people. As it stands, even if the security forces manage to oppress the uprising for now, the regime, as well as the president himself, have lost any remaining legitimacy in the eyes of the Syrian people. This means that the rest of his rule will have to rely even more heavily on oppressive measures, making him even more beholden to the old guard and security chiefs within his regime, and making another uprising that much more likely. Second, by oppressing the popular civilian uprising, he in fact strengthens, not weakens, the more fundamentalist elements within Syria and forces the moderates to go underground. Thus, even if there were to be no more popular uprisings, the regime risks dealing with an armed rebellion or even civil war in the not so distant future. 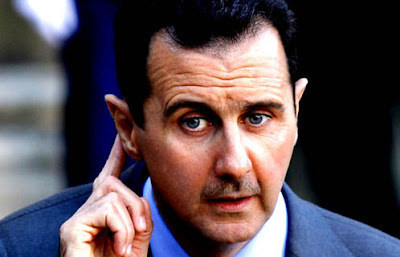 Just like the student in our metaphor, Bashar Al-Assad had a choice and had the time to carefully consider his options and revise his calculations before handing in his decision. Alas, by choosing violent oppression over dialogue, security over democracy, and oligarchy over social justice, he has made a calculation mistake… one that will ensure that whatever answer he arrives at will be the wrong one. In my mind, he kept on repeating the same mistake every time he had the chance to repeat that algebra quiz, every Friday...hence the question which remains unanswered is whether that student is taking the quiz himself or he is being bullied to make that miscalculation. We know now that this analysis was correct. Once you have opened the box it is hard to close it again because things have changed deeply and got very complicated.